I've got a few 5e friendly releases on DM's Guild. I don't sell as much on there as RPGNow, etc, but it's kinda fun to play in that sandbox once and a while. Also, I get to use their IP so there's that. 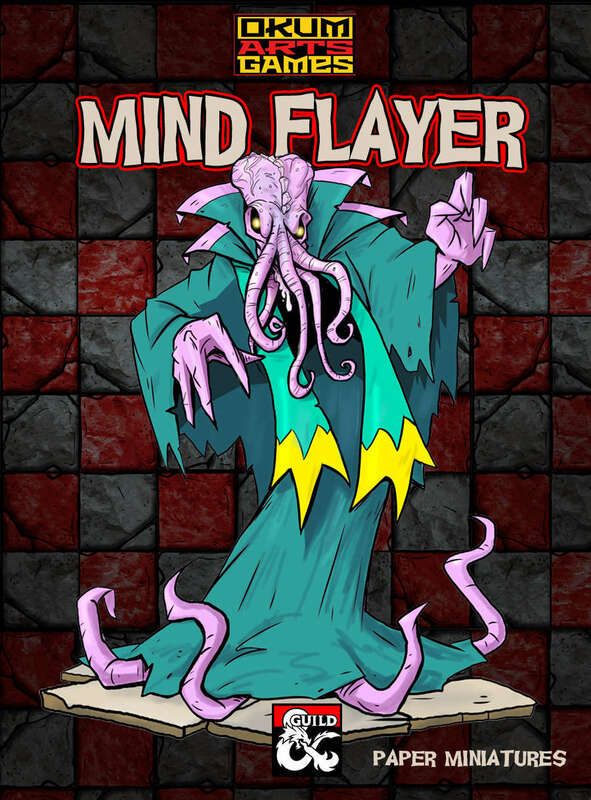 The first release was the PWYW Mind Flayer. 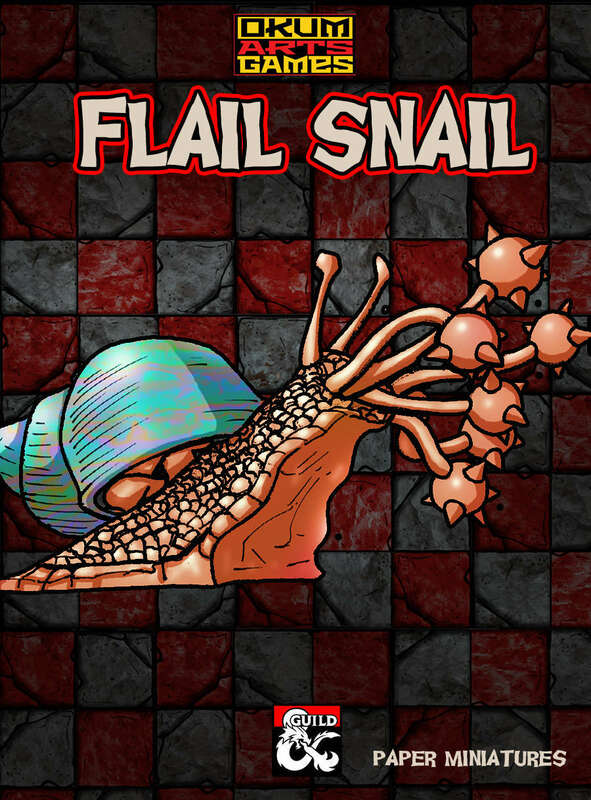 Then there was a PWYW Flail Snail. Now there is a set of Fighters. Now there is a set of Orcs and Goblins. Oh yeah, more paper minis are available. Yay! Honestly, I 'm thinking this is a failed experiment. 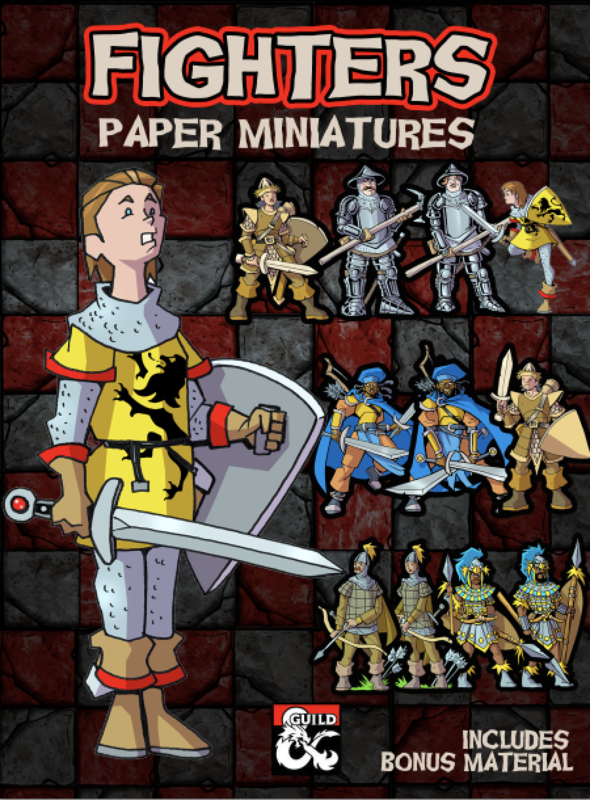 I don't think the target market for paper minis is anywhere near DMsGuild. That's too bad really. I'm considering seeing how they go for a while, but not releasing any more DmsGuild stuff and once more projects that I really need to get done are finished I will release what I can of these in a neutral format. I picked up the latest sets along with the previous ones when you first released them. Are they not selling? I would assume the illithids in particular would be popular. Yeah, it's really not great. I will keep the IP sets for sure. I'll see how they do overall. I have a bit of time to figure it out. Perhaps you should see it like this: Your own minis (Darkfast Dungeins, Save The Day, Extrastellar, etc.) are so popular that people would rather buy them than "copies" from the monster manuals...?! I don't normally haunt DMs Guild, so I hadn't known about these sets until just now. I'm sure I'll pick them up once I'm caught up on my printing and assembling backlog. I wouldn't think there would be IP issues with fighters or orcs, so yeah, it might be a good idea to move them over to RPGNow/DTRPG, where you have an established audience. For what it's worth, I'm glad to see modern (non-p'ork) orcs from OkumArts. I understand why the DFD orcs are pig-nosed, because that's how they were described in the early editions of the original game, but I thought that pig-faced orcs were a bad idea even then. They never looked like that in my mind in the 70s, whether I was reading Tolkein or playing 0e D&D. The FIghters have some inspiration from the 5e books. 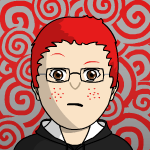 I also wanted to build this as a line to see how it goes. That's a fair point. To me orcs always had pig noses and it's hard to make that shift mentally. I moved away from that in the 90s, but I also didn't play D&D from about 1985-1999. I was a big Fantasy Hero fan. To me orcs always had pig noses and it's hard to make that shift mentally. I moved away from that in the 90s, but I also didn't play D&D from about 1985-1999. I was a big Fantasy Hero fan. Our group followed a similar path. We started in '77 or '78, playing a White Box/Chainmail/Blue Box hybrid until AD&D 1e hit. (My best friend and I actually came to roleplaying through SPI/Avalon Hill/Metagaming war games, and were playing the hell out of the original Melee/Wizard system as a skirmish game when we discovered D&D.) We played that until Champions hit, and played superheroes until the first version of Fantasy Hero dropped. At that point, we played FH for years. That's what I was playing when I moved away from my group that started in high school and lasted a few years past college, and basically dropped out of the tabletop hobby for nearly 20 years. But yes, we were big, BIG fans of Fantasy Hero, for all the same reasons we liked Champions--an infinitely flexible game system built on three or four basic game mechanics that were easy to grasp, and applied consistently throughout game play. 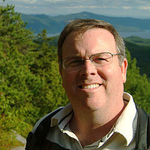 David: Sorry to learn sales aren't going well on DM's Guild, though as commented already here, the non-PWYW minis aren't strongly D&D-specific, and this IS a very specific D&D site, with a strong bias towards 5e. Plus there is a HUGE amount of free, PWYW and paid-for material on DM's Guild, so I'd guess these likely won't stand out against the crowd sufficiently there (it's more of an effort for purchasers/potential purchasers to locate items by publisher on DM's Guild than others of the OBS sites, for instance). Having been a regular visitor to/purchaser from DM's Guild since Day One, I have to say that while originally I tried to check details for quite a lot of fresh items, now I tend to skim the "new" list looking for things of very particular interest to me currently, and just pass on the rest, given there's only a finite amount of time available, and there is a lot of near-duplication of some topics (try checking for Ranger variants...). I also tried to post short reviews, but rapidly became swamped by the quantity of new items, and still have a vast list of things I've never properly read-through, despite having printed-out and used quite a lot of other items from the site over the years too! I suspect I'm not alone in suffering this level and kind of "fatigue", judging by the relatively few product reviews and ratings across the site (not to say the suspect nature of those - including ones supposedly posted by "Customer Name Withheld" - which sometimes seem unusually supportive or critical, without saying why). DM's Guild...IS a very specific D&D site, with a strong bias towards 5e. This is a good point--DMs' Guild is very 5e-oriented. If you're playing an older edition, especially 0e/BX/retroclone, you're probably going to find more, better adventures and supplements on DTRPG/RPGNow. I only look at DMs' Guild for two reasons: 1) One of my favorite paper mini artists has released a WotC "product identity" mini, which can only be distributed via DMG, or 2) I'm looking for a specific, old TSR product, and I've already checked DTRPG and found it's not there. On the other hand, the "typical" 5e customer--who is the target audience for DMG--is relatively new to the hobby, and knows it primarily or only through D&D 5e. Those people are steered heavily through marketing toward 3D minis, especially the WizKids prepaints that WotC licenses and collects a royalty on. If these casual D&D gamers know that paper minis exist at all, it's because they stumbled accidentally into a game shop that had a box of Pathfinder Pawns collecting dust on the shelf. I'm not sure exactly how we reach those people with the cardstock miniature message (without a marketing budget, at least), so it's probably worthwhile to put some PWYW mindflayers and rust monsters on DMG, with ads and links pointing toward your "real" cardstock minis lines over at DTRPG/RPGNow. I almost never learn about new paper minis through general searches through OBS sites. I find out about new minis here on the forum or the facebook page or I’m a Patreon supporter. 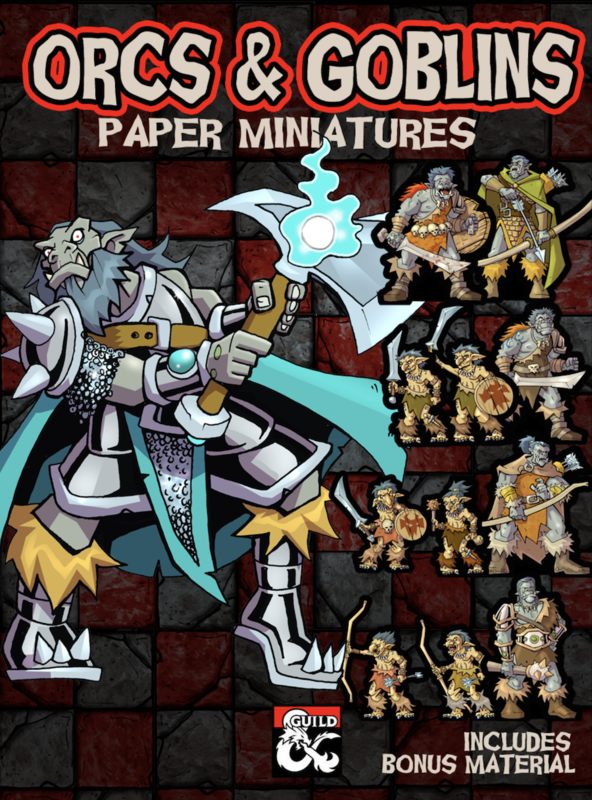 I also promote the heck out of paper minis and terrain across all of the gaming sites I inhabit on the internet. nolabert: The "New" OBS lists (accessible from the DTRPG or RPGNow homepages) do reduce the amount of stuff you have to hunt through for the latest on any papercraft items that have appeared since your last visit, and you can tailor some of the e-newsletters you receive from OBS towards papercraft items too, as well as signing up for news from your favoured publishers there. Trying to find older items - which are often at least as interesting, of course - can be more difficult, and may come with extra problems, like previews, publisher websites or images that no longer exist (or rather that don't have working links to any that do). You are right though that this CWF does a good job of finding and notifying us all of new papercraft minis and models, including the freebies that aren't available via OBS, of course (e.g. the monthly Hoards, Eddnic, etc. )!